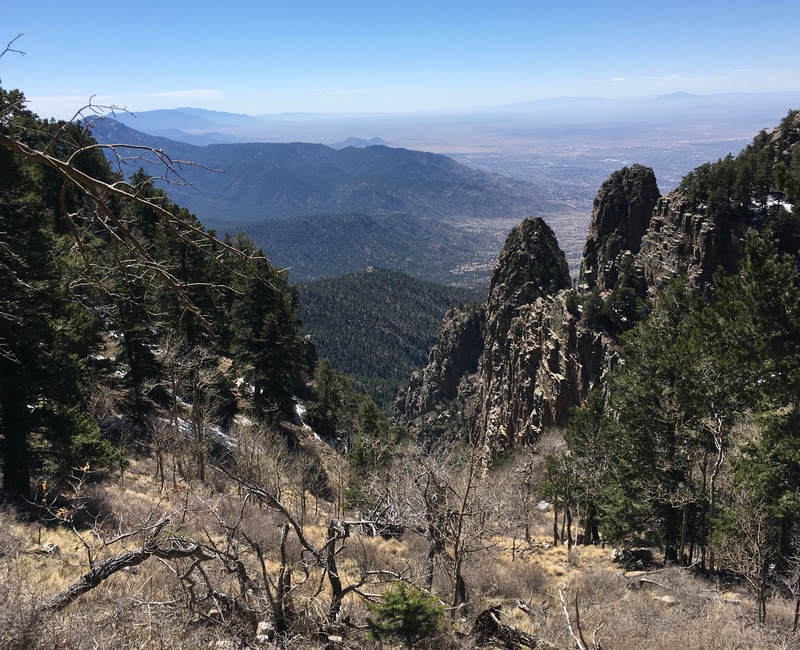 The Domingo Baca Canyon Trail, the La Luz Trail and the Crest Spur Trail form the uphill section of a loop that begins in Albuquerque and leaps to the highest point in the Sandia Mountains. 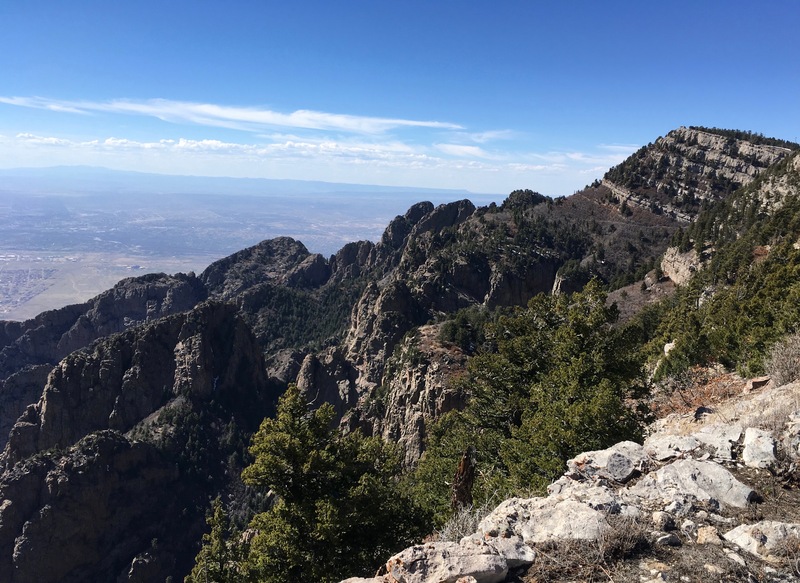 The Crest Trail and the Pino Canyon Trail form the downhill portion of the loop from the summit back to Albuquerque. This is a seriously strenuous scramble. Readers who have just finished hiking the Pacific Crest Trail will find it mildly diverting. Ordinary mortals, however, must use caution. The route up Domingo Baca is a steep and protracted scramble – retreat due to bad weather or under icy conditions is not desirable. The Crest Trail can be a mellow experience, but snow can stress your navigation skills and lightning can spoil your ridge ramble. 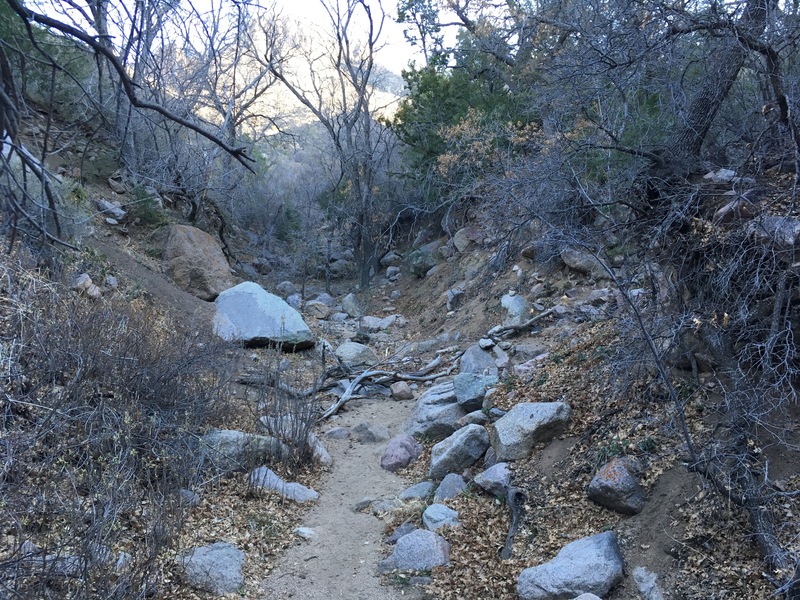 The final descent through west-facing Pino Canyon will test your water logistics, particularly if it’s warm. The hike is time consuming and the road into the Elana Gallagos Open Space is gated shut (bang!) at 7:00 pm. That said, this is a hike through the vertiginous dreams of a spaghetti-western director. 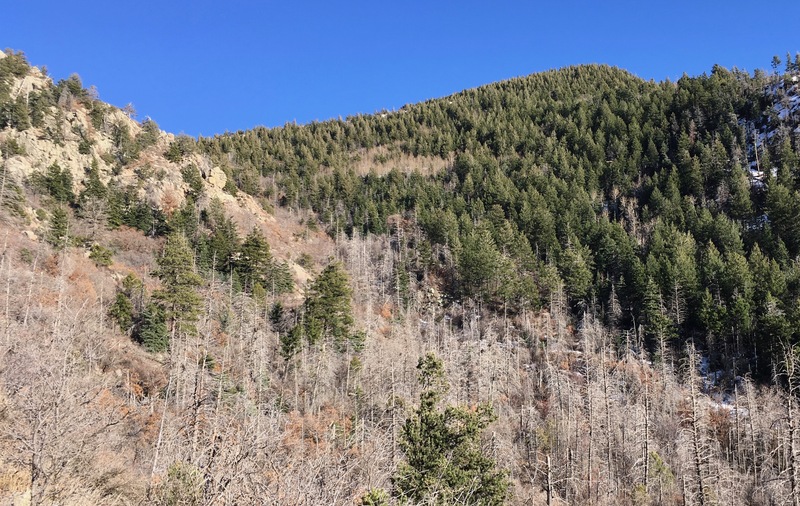 Go on a day when you’re feeling strong, when the sky is blue, the temperatures are mild, the days have lengthened and the Crest Trail is free of snow. From I-25 heading north in Albuquerque, take exit 232 for El Paso Del Norte (NM 423). Stay to the right. After 0.1 miles veer right at a secondary off-ramp signed for El Paso Del Norte East. This puts you in the left-hand lane of a 3-lane frontage road. It will help if you can get into either of the right-hand lanes. After another 0.4 miles the frontage road arrives at the intersection with El Paso Del Norte East (NM 423) where it forks around a traffic island. Stay to the right of the island and turn right (east) onto NM 423. After 4.8 more miles arrive at a T-intersection with Tramway Blvd (NM 556). Turn right (south) onto NM 556. After 1.2 miles, after a very slight bend to the right, look for Sims Park on your left. Just before the intersection there is a roadside sign for Elena Gallegos Park Road on the right side of the road. The Sims Park intersection does not have a traffic light. Go left (east) onto Sims Park Road. After 1.3 miles arrive at the guard station for the park. On the south side of the station is a self-service pay station. After paying, follow the road as it curves tightly behind the guard station and then starts back towards the west. Immediately on the right will be a road headed north. Currently the only road sign says “Kiwanas”. Go right (north) onto this road. After 0.3 miles arrive at the Cottonwood trailhead and park. The entry fee is currently $2.00 on weekends and $1.00 on weekdays. Put the envelope stub close to the windshield. The park has covered picnic tables and there are vault toilets just before the trailhead (on the right, screened by junipers). I did not see any water. The park is popular and on weekends parking can be scarce. The park is gated after hours (currently it is open until 7:00, check with the park’s website). There are several online reports of car break-ins. It may be wise to keep your gear out of sight. Distance: 15.4 miles (round trip). From the trailhead follow trail 230A (signed) about 100 feet to where it merges with another trail going right (uphill). At 0.5 miles from the trailhead pass an intersection with Trail 342. At 0.7 miles pass a second intersection, this time with Trail 341. Both of the intersecting trails come in from the right, simply keep going straight ahead. At 0.8 miles the trail comes to a third intersection, also signed. Trail 230 goes straight ahead, but go right, past the “Domingo Baca Trail” sign, and onto USFS property. This tread takes aim at a large knoll of tough rock that is being weathered into hoodoos, contours around the base of the knoll, and then drops into the bed of Domingo Baca Canyon. Follow the path as it turns up-canyon and dives between canyon walls north and south. As you ascend the walls begin to pull together. Nearing the pinch point you will find the remains of a rough stone shelter, about 1.6 miles from the trailhead. Push through the narrows and into a bowl with good views of the high terrain that is your destination. Looking about you will see pinyon pines, an indication that you’re transitioning out of the Upper Sonoran life zone. On this date there was water to be found in the canyon bed. The first navigation challenge comes at about 1.8 miles from the trailhead where you must leave the waterway. Watch for a section where you pull out from under dense canopy, passing a table-like rock about 10-foot long and 3-foot high on your right and then onto a 15-foot stretch of sandy tread. Here you might find that the path upstream is blocked with a pile of branches (although any floodwater is likely to make short work of that). A better indicator is a blocky, whitish boulder that presents an arrowhead silhouette to hikers coming up the trail. To your left there will be an obvious path up the north wall of the gully. Don’t take that! Instead, look to your right for an obscure, rough, rock-strewn tread up the south wall of the gully. Take that. Above the gully the tread heads out on pleasant, nearly level terrain. The path goes almost due east until it begins to run up against the walls of the bowl, then swings a bit more northerly. Somehow, unnoticed, a rocky wall 20-feet high has crept up on your left side. A stream bed (with running water on this date) has formed beside the trail. Growth in this portion of the canyon is exuberant. Even the scrub oak and the juniper bushes have formed serious boles and are jostling for skyshare. The terrain begins to steepen. Waterfalls form in the stream bed. At 2.7 miles the trail takes a turn to the north, seeming to pull away from the main flow of the canyon. The path now takes dead aim at an immense pair of rocky spires that tower above your head. Strange sounds penetrate the forest that soon resolve as coming from the high wires of the Tramway. You may see the tram itself pause overhead and hear amplified guide-patter coming from above. Wild, yes. Untrammeled? Not so much. As you ascend higher into the canyon the trail goes directly below the Tramway then slowly pulls away. At about 3.4 miles from the trailhead come to a boulder pile obstructing the canyon bed. Most people will find this an easy challenge, provided that your boots are dry and rock is free of ice or snow. 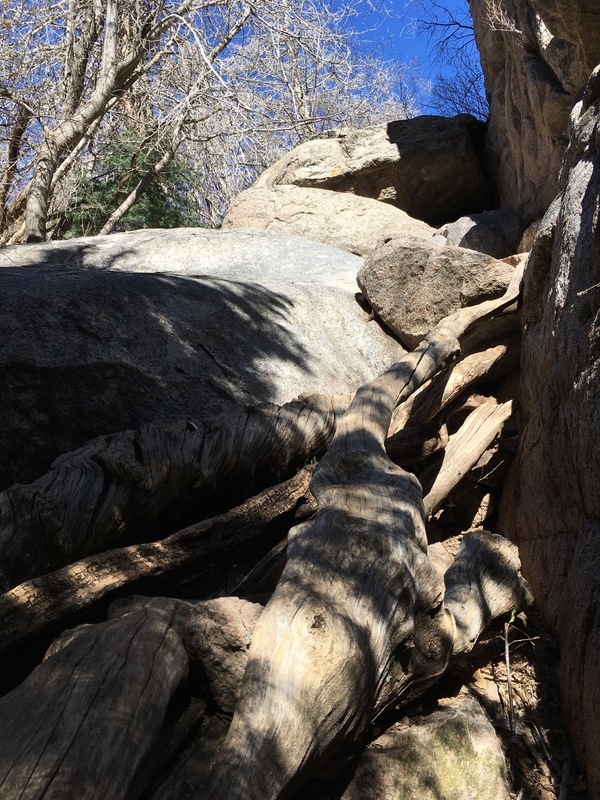 A log braced against the lower rock gives you access to a shelf about half way up, then it is a matter of creeping carefully past the uppermost boulder to regain the trail. If you have party members who are not comfortable with this level of exposure there is an alternative route. You can find the junction just a short distance down-stream, adjacent to a thick, 20-foot tall snag in the middle of the trail. (A detailed discussion and a GPS track can be found in the Ondafringe link, below). A short distance above, at the foot of a cliff, come to the site where TWA flight 260 met its end. The trail jogs to your left and tracks a sobering story expressed in shredded aluminum and smashed engine blocks. 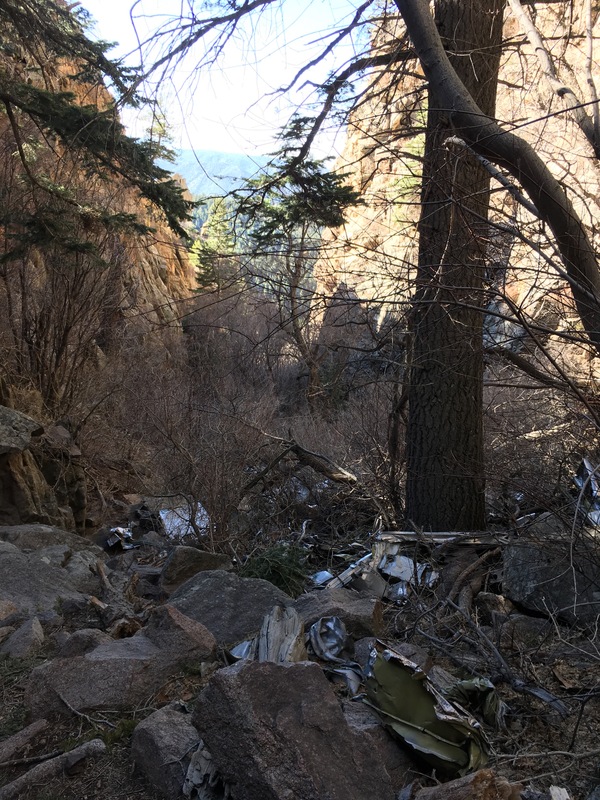 In an otherwise spectacular canyon – soaring rock walls spaced only 20 or 30 feet apart – this sad tail of lost lives and concentrated wreckage seems to never end. Scramblers take heed, experts attribute this disaster to a failure of the aircraft’s compass. This is a memorial site, please leave the debris where it fell. Few hikers climb above the crash site so it is not surprising that the tread becomes much fainter above the narrows. Keep to the canyon bottom which trends just a little east of north. At 3.8 miles, about 9000 feet of altitude, come to another potential navigation problem. A huge cliff face drops right to your boots. There is one opening to its left and one opening to its right. Which to choose? The map will show that I explored the left-hand option first (see the little stub going off to the northeast). Most navigators, however, will point to the obvious tread tucked up against the eastern wall of the “above-right” canyon and ascend in that direction. It now gets steep and you enter a scrub oak thicket. If it were completely untouched then passage would be impossible. Fortunately, kind and unbelievably strong volunteers have lugged saws and brush clippers into this high realm. Take advantage of their handiwork. This might be a good place to stop for a bite to eat and careful consideration of your next move. Is the weather still good? Is the party OK with the altitude? Great! If not, then a return from this point will be a great deal easier than retreat from the ever-steeper bowl above. Clamber the slopes, side hilling where the soil shows signs of releasing from under your boots. The tread ascends straight up the hill without pause or apology. Practice you rest-step and remember to look over your shoulders for intense views through the narrow canyons and out onto the Albuquerque basin. At 4.4 miles come to a pleasant surprise. The thickets give way to a narrow grassy shelf and the terrain above, while still steep, is open. You may hear voices from hikers above you. There does not seem to be any obvious tread off of the shelf. For the sake of keeping the grasses (and soil) in place it is best to make your own careful zig-zags up the slope. 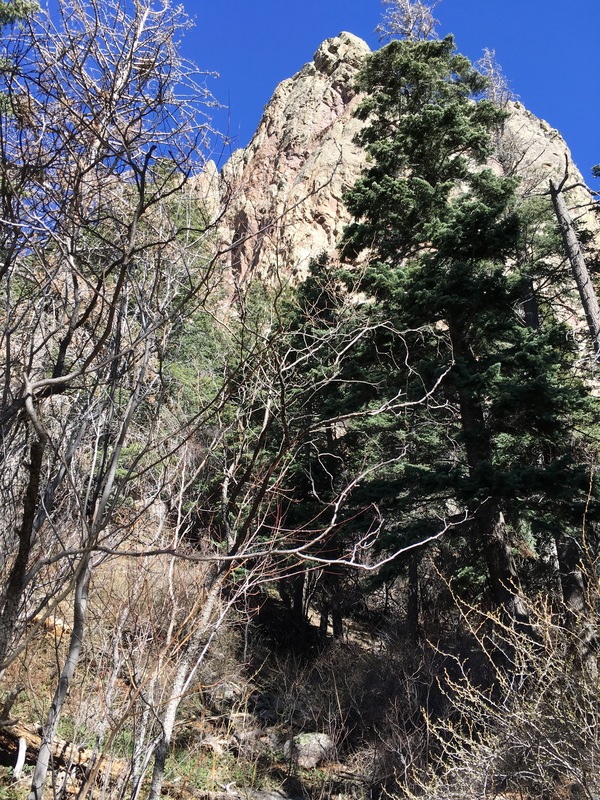 At 4.5 miles make a glad entrance onto La Luz Trail. Turn west (to your left, looking uphill) and follow the La Luz as it contours around a ships-bow buttress and heads north towards a small saddle. In the saddle find a signed junction with the Crest Spur Trail. That is your path to the Crest House on Sandia Summit. Reach the summit having hiked 5.7 miles from the trailhead. There is a cafe in the Crest House and it is a rare luxury to sit atop a summit with hot coffee paired to your chips and salsa. There ought to be great views all around, although on this day the haze made it hard to pick out even Mt Taylor. Cast your eye over the parking lot and sympathize with those overheated engines. After refueling, find the Crest Trail going south from the Crest House and towards the tramway. This portion of the hike sees very heavy use and the tread is initially paved. The trail soon departs from the crest top and drops a short distance to the east. Numerous trailside signs identify Corkbark Fir and Englemann Spruce, conifers from high in the Canadian Zone. On this date there was as much as two feet of snow remaining on the ground. Put on your gaiters and don the microspikes. 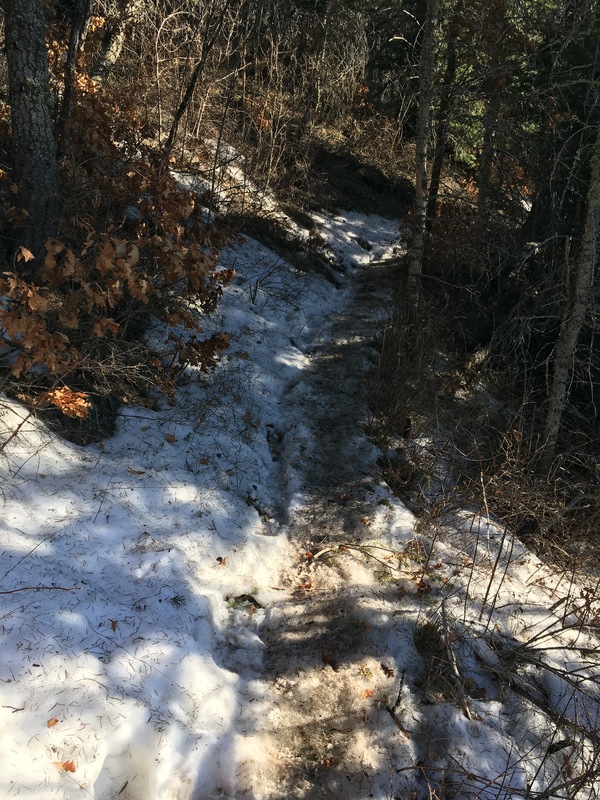 The trail is obvious and icy for long stretches. Then, for no clear reason, the beaten track will braid out into individual boot prints. Pick a line that parallels the crest and continue south. The tread skirts below a stone building called the Kiwanis Cabin, reaches an overlook and then descends westerly along a large field called Kiwanis meadow. At the low end of the meadow return to the Crest trail and continue south, reaching the Tramway at 7.1 miles from the trailhead. Thread through the tramway/ski area complex (this involves staircases) and at the forest’s edge find a signed return to the Crest Trail. There is a marked reduction in trail usage here. Post-holing through deep and/or rotten snow can be tiring and slow. That 7:00 pm gate time can begin to seem worrisome. You can’t be certain of being on the trail when it is snow covered. When in doubt, return to the edge of the crest and push south. At 8.1 miles come to an overlook with great views of the crest to the south, marked as Point 9835 on the map. Looking ahead you will see, below you, a buttress on the crest bulging out to the west and, beyond the buttress, a higher stretch of ridgeline with a large bump on its southmost extremity. That bump is very close to the Pino Canyon Trail junction. The terrain forces you west from Point 9835. At about 9600 feet altitude you may find yourself returning to the tracks on the Crest Trail. On this date it was quite distinctive – leaves and needles seem to accumulate in the trough beaten into the snow. Follow it south as it contours around the east side of big bump to reach the signed intersection with the Tree Spring Trail and the 10K Trail (8.7 miles from the trailhead). Stay on the Crest trail as it gradually swings to due south. Here you depart from the comfort of hugging the crest and are tracking the ridge you saw from point 9835. This is easy hiking on a tread that rarely departs from the 9400 foot contour line. Eventually it swings a bit more westerly, descending to 9200 feet and at 10.5 miles reaches a saddle and the signed junction with the Pino Trail. This is a popular trail and just about all navigation issues end at the saddle. Gaiters may no longer be needed. The top of Pino Canyon Trail, however, descends a north-facing canyon wall on closely woven switchbacks. It can be extremely icy. Your weary legs will be happy that you kept those traction devices on! Down and down and down it goes until reaching 8600 feet. From there it takes dead aim at the setting sun and stretches out for Duke City. 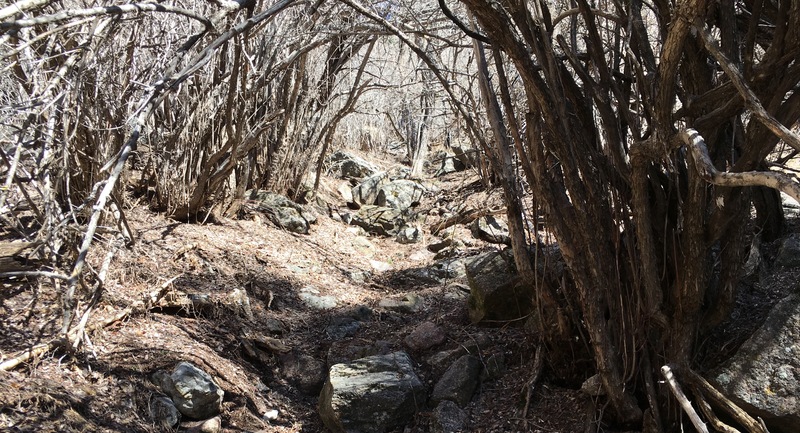 Pino Canyon has its own somber aspects. A once-magnificent forest occupied this canyon but drought and bark beetle have decimated the middle reaches. The standing deadwood is also something of a threat; be careful if the winds are strong. Look north for views into the spectacular terrain you’ve been traipsing through. Pino Canyon: green above, dead below. At 12.7 miles the trail significantly flattens and re-enters the domain of juniper trees and cacti. The tread becomes sandy. At 14.2 miles leave the Cibola National Forest through a gate and return to the foothill trails of the Elena Gallegos Open Space. Almost immediately you will want to go right, through a gate, to stay on the Pino Canyon Trail, #140. This is a long, level, nearly straight-line shot across the open space towards the Pino Canyon Trailhead. Unfortunately, this is not the same trailhead where you left your car. Turn right and continue slogging down the road (paved) to where it returns to the guard house. There, turn north (to your right) past the “Kiwanis” sign and return to your car having hiked 15.4 miles. If you’re a little worried about the shape you’re in, if you’re hiking with people fresh from sea-level, or if your navigation skills are a little rusty, then why not hike one of the lower legs of this loop? The tread up to the TWA site is challenging and solemn, but it is filled with running streams, attended by soaring canyon walls and populated with tall Ponderosa and thick Douglas fir. 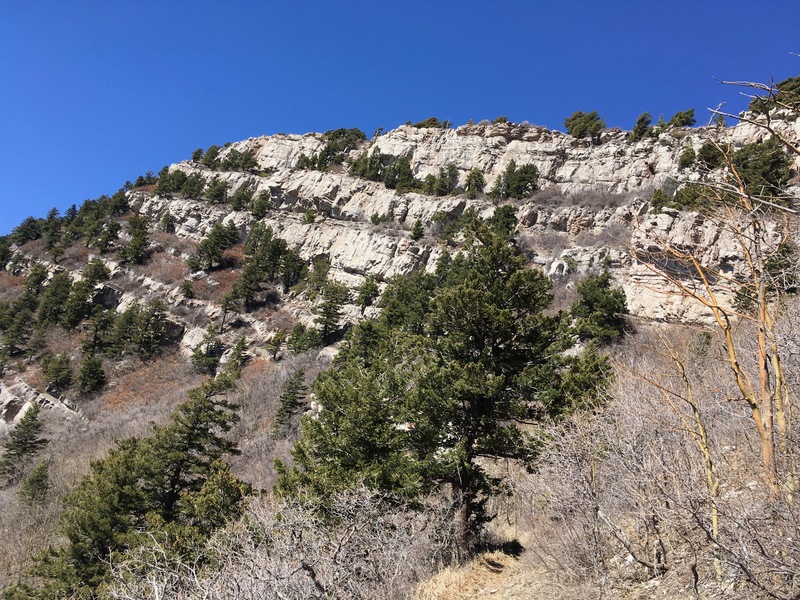 The Pino Canyon Trail can’t quite match that solemnity and grandeur, but it is a terrific hike through high terrain on a carefully tended tread. On a cool, sunny March day I went through about 2.5 liters of water. I would have gone through a lot more but I was in such a hurry at the end that it never came out of my pack. It seems certain that this west-facing hike gets baked during the summer. In those conditions 5 liters might not be sufficient. Watch the weather. You don’t want to be on the crest when a line of thunderstorms strike. Pick a different hike if it is monsoon season. Similarly, in winter and early spring you can be confident of encountering long icy stretches on the trail. Traction devices are essential. I had a single hiking pole but it would have been helpful to have had a second, especially while punching through snow-crust along the Crest. It is important to have confidence in your navigation skills. It is even more important to have reason to be confident in your navigation skills. If you are not practiced at working your way through the mountains with a map and compass then this is probably not the place to begin learning. In the same light, pay attention to the members of your party and their experience with off-route situations. If it makes them uncomfortable then you can do everyone a huge favor by picking a different hike. In a pinch you might have the option of descending either on the Tramway or on La Luz Trail. Just remember that those options terminate quite a long ways north of the trailhead. Alternatively, you might be able to beg a ride from folks who have driven to the summit. It won’t do much for your pride but it might be preferable to an unscheduled “bivy” on the Crest. On this hike I parked at the trailhead nearest Domingo Baca Canyon. That was a poor choice. It would have been better psychology to park at the Pino Canyon trailhead and get the trudge down the paved roads over with first thing. 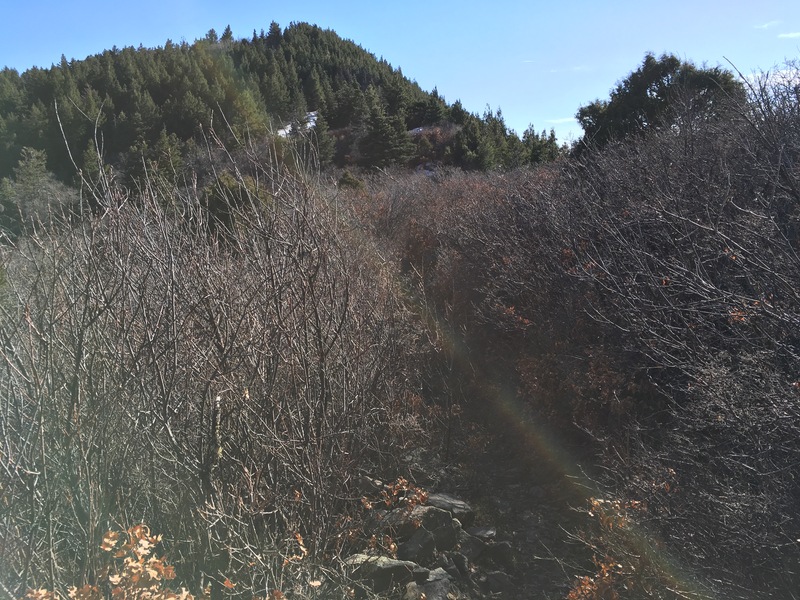 This map suggests that you could connect to trail 230A from the Pino Canyon trailhead using the “nature trail”, thereby saving some milage and skipping the road trudge entirely! In good weather the Crest Trail is open for horse riders. If you meet horses on the trail then please step off the trail to the downhill side. The TrimbleOutdoors site names this loop the “TWA Canyon Challenge” and provides a brief description and a GPS track. Note that the GPS track doubles-back on itself in several places. This is typical of GPS tracks in narrow canyons. The canyon walls reflect the satellite signals, which renders the tracks (including those shown here) approximate at best. The site describes the tread above the TWA site as “faint”, “little used” and “steep”. All true. 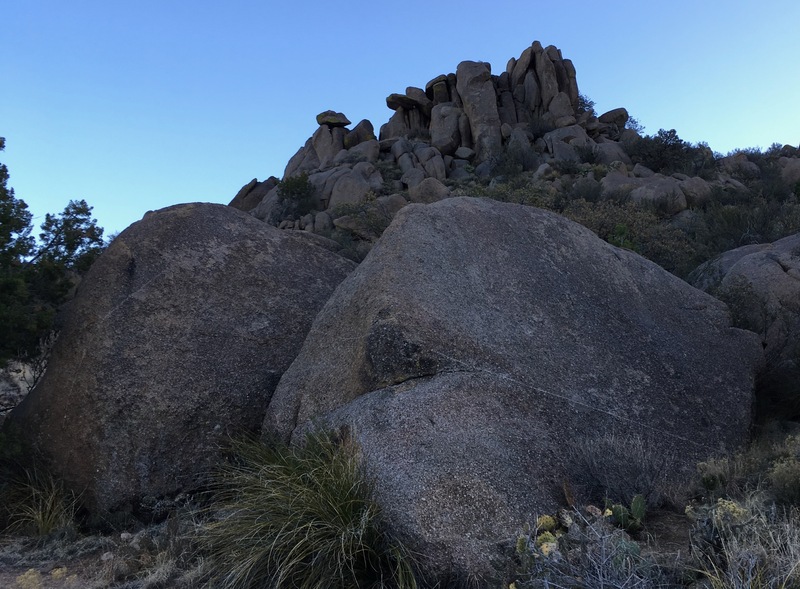 An excellent description of the hike up Domingo Baca Trail to the TWA crash site, which includes some history, numerous photos and instructions for going around the boulder problem, can be found at the ondafringe website. 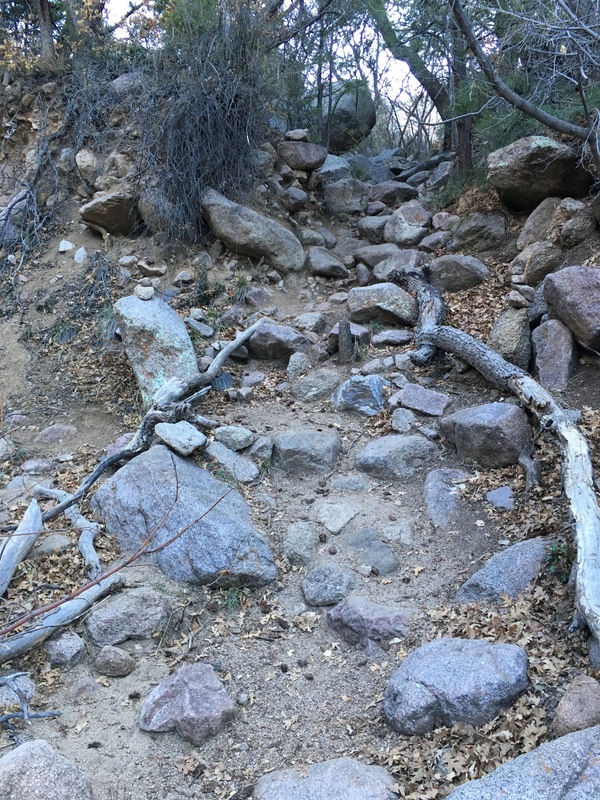 That same site has separate pages here and here describing the Pino Canyon trail along with maps and video. A short but very detailed description of the Domingo Baca Trail to the TWA site can be found at Cibola Search and Rescue. It’s an older report, from 1997, and some of the details may no longer hold. Neverless, it does emphasize the importance of getting out of the gully in the early part of the trip. It describes the stony exit as a waterfall, which may be the case in wetter years. Better, it tells you what to expect if you happened to stay in the gully and ascend past the exit. At least one report mentions poison ivy on the trail up to the TWA site. Watch for it as the weather grows warmer. Not certain about ivy spotting? Here is a helpful guide. 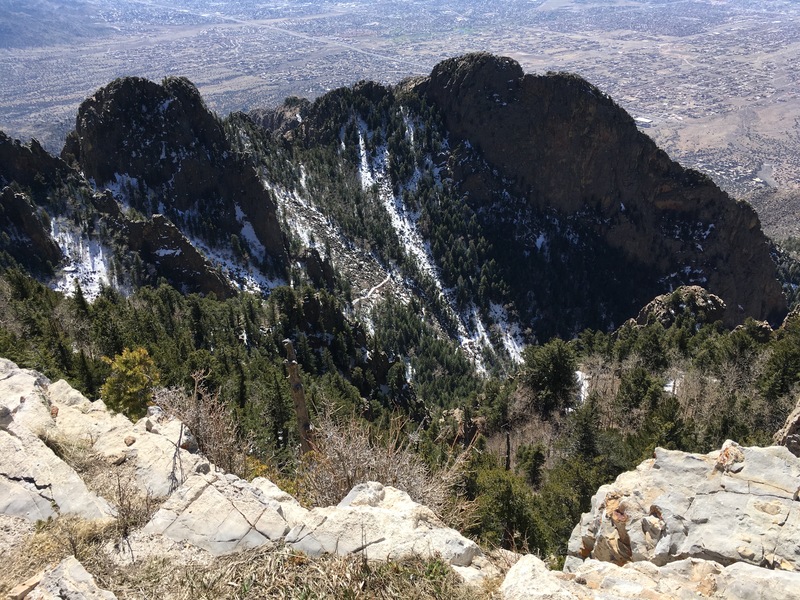 A useful description of the lower Domingo Baca trail, along with a table of waypoints, can be found here in the Sandia Mountains Hiking Guide. That same site also has a useful description and maps for a crest-top loop. 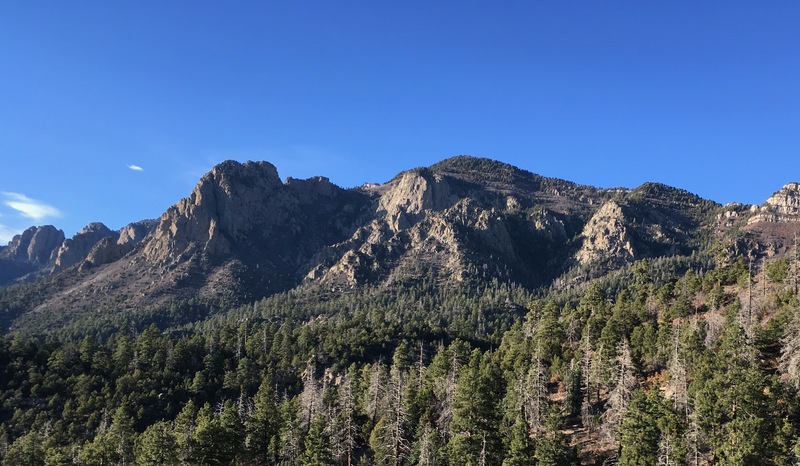 This loop overlaps with the sections of the La Luz, Crest Spur, and Crest Trail to the Tramway that are described here. (The chief difference is that the crest-top loop goes north from the Tramway to return to the summit, whereas the route described here goes south from the Tramway to descend to Pino Canyon). 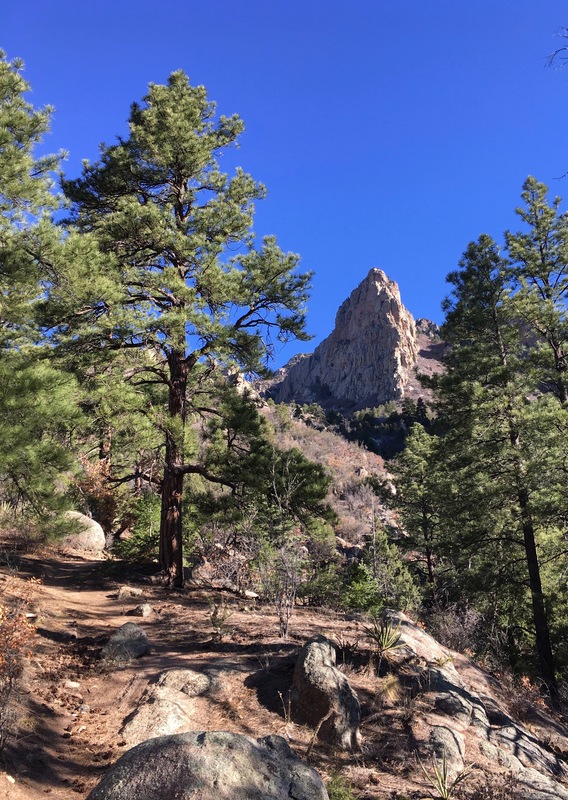 The Albuquerque Journal makes mention of the Pino Trail. They rate an up-and-back hike on this trail as difficult. On this loop you would only be doing the “back” portion, but it is worth noting that your one-way leg involves 4.5 miles of hiking and 2800 feet of altitude loss. That could be significant if the exit road is about to be gated. The Forest Service has a simplified map (not topological) showing most of the route described here. It only shows trails, however, so the off-trail scramble at the top of Domingo Baca Canyon is not depicted. The Forest service also has a simplified map of the many trails surrounding the Crest House. Give it a glance so you’ll know what kind of snarl you’re going to navigate through. 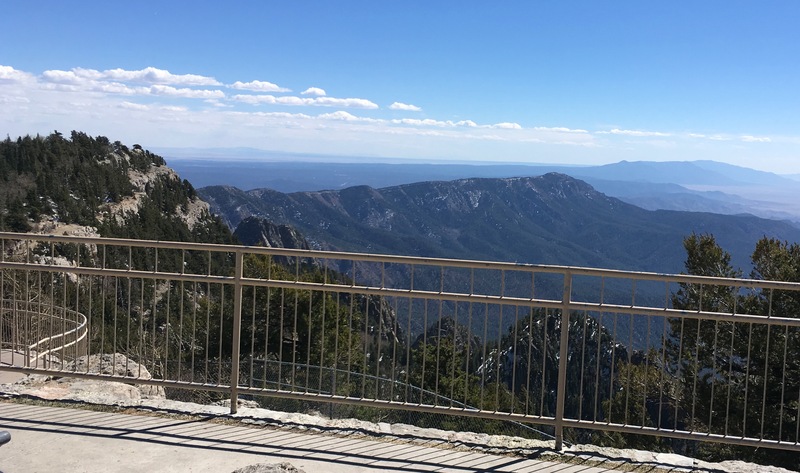 Weather conditions in the Albuquerque basin can be very different from weather conditions on the Sandia summit, even though they seem adjacent on Google maps. There is, after all, a mile’s difference in altitude between them. The Crest Trail, #130, is within the Cibola National Forest. The Forest Service describes this trail here, and provides contact data. The best way that I know to get information on the state of the Crest Trail is to call the contact number. 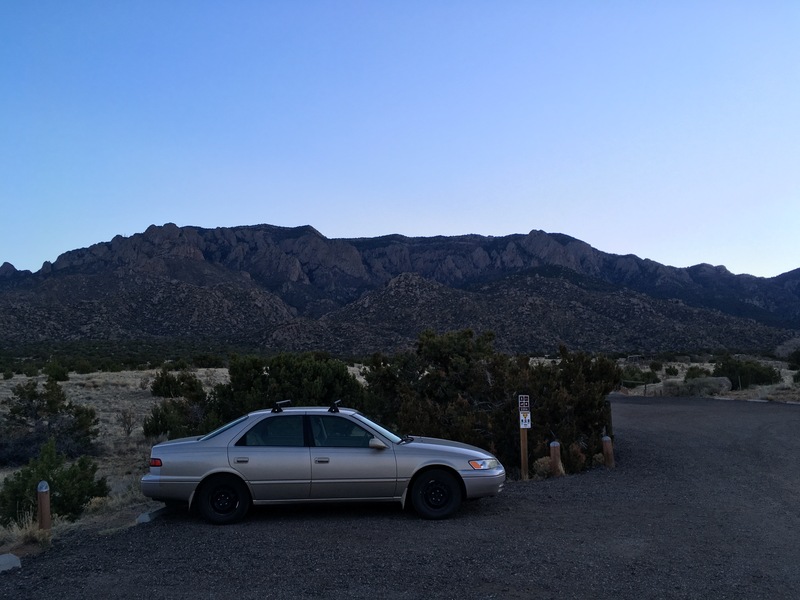 Currently the phone number for the Sandia Ranger Station is listed as: 505-281-3304.